1 cubic foot of water is 7.48 gallons. Water use from 0-600 cubic feet per billing period is covered by the base rate. This is 4,488 gallons of water. The most common ways that people discover a hidden water leak are through an abnormally high water bill or contact from District staff. If your meter shows ‘spin,’ or water moving through the meter constantly, for 24 hours or more, our staff will receive an alert. Reasons for a 24-hour spin can include a forgotten hose or faucet running, a running toilet or leaky fixture, or a more serious leak. Generally, notification will be made by a door hanger left on the front door, or sometimes by phone. The District also monitors accounts for high usage. All accounts with high usage are reviewed by our Utility Systems Specialist and compared to the account history. If there has been a large jump in usage, we may contact you through a high-use notification letter or by phone. Occasionally, we will receive a call from a concerned neighbor when a leak is evident, and will facilitate contacting the property owner and when necessary, shutting the water off to prevent issues. If you think you might have a water leak, you can find tips on how to find it here. Why do I see District vehicles in my neighborhood so often? Every day, our maintenance crews and Utility Systems Specialist are out in the neighborhoods within the District. They are doing routine maintenance on the pump stations that bring your water, addressing customer issues, reading meters, tackling improvement projects, maintaining fire hydrants, notifying customers of high use or possible leaks, making sure meters are in working order, and more. If you have questions, please feel free to call our office! What does it mean to flush a water main and why are you doing it? Water main ﬂushing is the process of cleaning or “scouring” the interior of water distribution mains (pipes) by sending a rapid ﬂow of water through the mains. Distribution mains convey water to homes, businesses and hydrants in your neighborhood. Flushing helps maintain water quality. The water entering distribution mains is of very high quality; however, water quality can deteriorate in distribution mains if the mains are not properly managed. Flushing the lines removes sediments from the mains and helps to remove water that can get caught in dead ends. When you see a ‘Water Main Flushing in Progress’ sign in your neighborhood, it means that some part of the area is being flushed. Signs may stay up for quite a while since flushing is routine maintenance, and sometimes gets bumped by more emergent work. Most individual customers are only directly affected for a few hours each as we flush past their property. Sometimes during flushing, some sediment may get into your home’s plumbing. If this happens, please be patient and allow your cold water to run for a few minutes at full velocity. During this time, you should avoid using hot water to prevent sediment accumulation in your hot water tank. In accordance with the Federal Government’s re-authorization of the Safe Drinking Water Act of 1996, all public water utilities and companies are required to prepare and provide annual drinking water quality reports to their customers. As well as being required by Federal Law, we want to keep our customers informed about the excellent water services that we provide. Our primary goal is to provide safe, dependable, and high quality drinking water to our customers. Click here to view the most recent consumer confidence reports and learn more about water quality in the District. Where is my sewage treated? 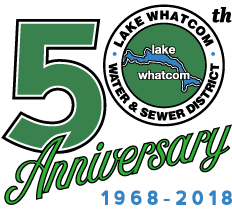 Because the entirety of the Lake Whatcom Water and Sewer District is located within the boundaries of the Lake Whatcom Watershed, all wastewater must be transported to the City of Bellingham’s wastewater treatment plant located at Post Point in the Fairhaven area. The City of Bellingham’s sewage treatment bill accounts for roughly 1/4 of the District’s annual operating budget. Sewer disposal costs and a share of the City’s facility upgrades and maintenance costs to the District are based upon the volume of sewage that is sent to the wastewater treatment plant. The District has three distinct water systems serving the mostly residential areas around Lake Whatcom. The Agate Heights water system serves a small residential area near Agate Bay with water from an artesian well. The water is drawn from the well and treated at our Agate Heights Water Treatment Plant before being piped to the residences that it serves. The Eagleridge water distribution system serves a small residential area on the North Shore of Lake Whatcom with water that is purchased from, and treated by, the City of Bellingham and piped through the District’s water distribution system to its customers. The South Shore water distribution system serves the Geneva and Sudden Valley areas with water treated at our water treatment plant in Sudden Valley.